Join us for Thanksgiving 2018! It’s already October and Thanksgiving is just around the corner! We will host our annual Thanksgiving feast on Thanksgiving Day, November 22nd. 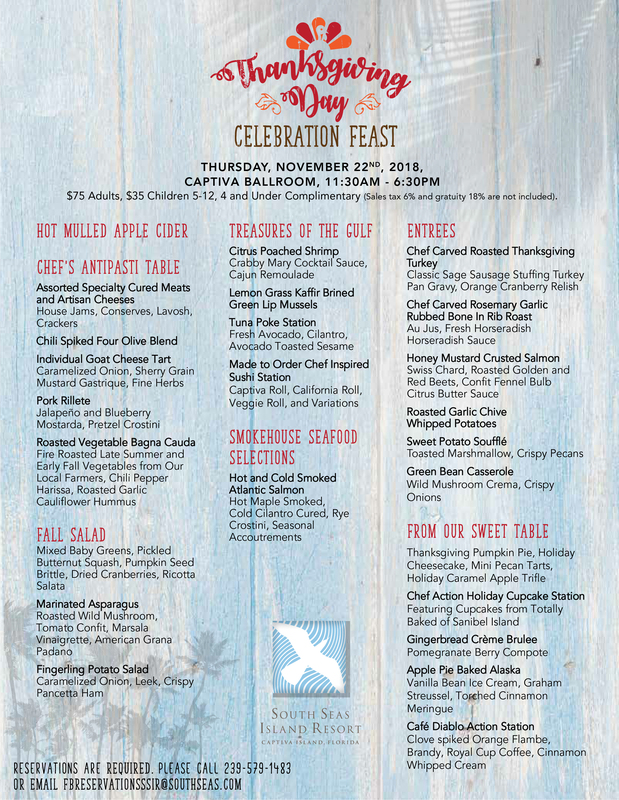 Our festive holiday buffet will feature traditional favorites as well as local island fare. To view the entire menu (PDF), click here! In addition to traditional entrees including roasted Thanksgiving turkey, rosemary garlic rubbed prime rib of beef and honey mustard crusted salmon, Thanksgiving day diners may enjoy a “Treasures of the Gulf” station that will boast citrus poached shrimp, lemongrass kaffir brined green lip mussels, tuna poke, and handcrafted sushi rolls. Live music will fill the ballroom all day. The Thanksgiving feast will be served from 11:30AM to 6:30PM and is priced at $75++ for adults, $35++ for children ages 5-12 and children under 5 are free. Private party rooms are available for parties of 12 or more. Those wishing to enjoy a festive feast in the comfort of their own accommodation may enjoy “Turkey on the Run”, a fully-prepared feast that serves 6 to 8 people. Priced at $175 per group plus tax, Turkey on the Run feasts are delivered to guests on Thanksgiving Day between 10AM and 1PM, complete with all accoutrements and reheating instructions. Turkey on the Run must be pre-ordered by November 15th. Reservations for Thanksgiving dining and Turkey on the Run may be made by email ([email protected]) or phone (239-472-5111 ext 1483). We hope to see you for our festive feast!